Check out these Sega Twister Pinball Machines for sale. You will also find parts and accessories including the fan topper, cow toy, LED kit, Ramps, Pop Bumpers, Speaker Upgrade, Flyer, Sound Board, Flipper Rebuild Kit, Fuse Kit, CPU Rom Chip Set, Translite, Playfield Plastics, Target Set, Mods, and Custom Target Decals. 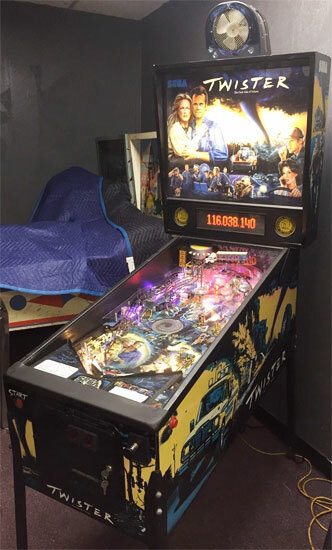 Twister has a very simple playfield layout, some fun ramps, three multiball modes, decent flow, and very sweet DMD animations. You need more Bill Paxton in your life! Check the listings below for available machines.